Now that you’ve got breakfast, dinner and dessert covered here are four more simple things you can do to spread the love this Valentine’s Day. One of the best ways to celebrate Valentine’s Day is to do something small, and when it’s least expected! Whether you pay for your colleague’s cup of coffee or slip a note of encouragement in a friend’s purse, a little kindness goes a long way. Show your little ones some extra love. While they are away at school, cut out different sized hearts from red and pink construction paper. Hang them around their room with clear fishing wire for a sweet surprise when they arrive home. Everyone loves staying snuggled up in a cozy bed, especially if they can also enjoy their favorite Chick-fil-A breakfast item. 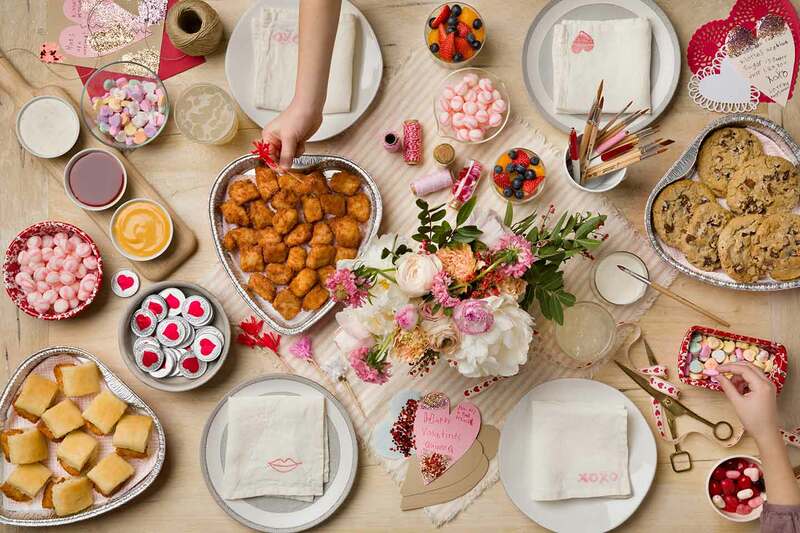 Surprise your sweetheart with a heart-shaped container filled with Chick-n-Minis for a memory that will last forever. Two simple words that can easily be missed when you’re showering others with love – treat yourself! Put on your favorite show, take time for some extra pampering with a manicure, or meet a friend at your favorite lunch spot. No matter how you choose to celebrate, let Chick-fil-A help you make it a little sweeter. Contact your local restaurant to see whether the trays are available before placing your order. This Valentine’s Day, we’re letting you in on a little secret: The sweetest gestures don’t always require a trip down the candy aisle. From a heart-shaped Chicken Biscuit to a Chick-fil-A Nugget and Waffle Potato Fry bouquet, there’s are plenty of ways to make someone feel special with Chick-fil-A.